There are a lot of, a lot of delicious food in Japan that I know everyone in the world likes. But don’t you forget “the dark side”! I guess many Japanese people, of course including me, like these 5 GREAT foods that I’m about to introduce to you, but I also guess that people from other countries might not like them, or even WORSE you might not even be able to chew and swallow them because it tastes HORRIBLE to you. But you know, when you see these kinds of food, my friend, don’t think!!!! Just EAT!!! Here comes the 5 Japanese foods you might not like and I won’t explain what they taste like because it will make them less exciting. All right, are you ready? On your mark, ready, set, goooooo!! This is one of the most famous Japanese foods in the world – fermented beans. 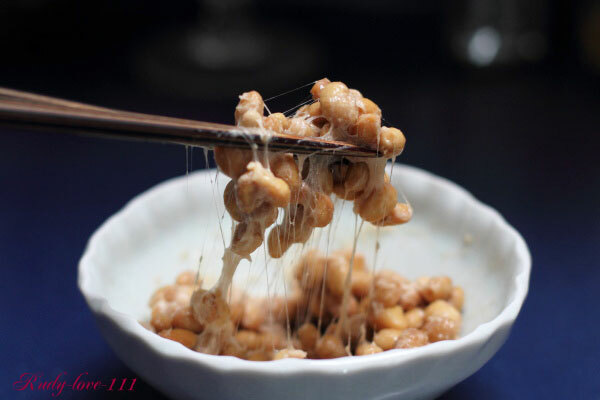 If you live here you probably have been asked the question “Have you ever eaten natto?” by Japanese people, haven’t you? Yap, we like to ask that question, it’s automatic. When we see expatriates, we feel like we have to ask that particular question. Ika=squid, Shio=salt, Kara=spicy, this would be a direct translation. But actually it’s not that spicy, just pieces of squid and pink-milky-liquid, you don’t wanna know what it’s made of. (Answer: their internal organ) I looooove it. Q: WHAT THE HELL IS THIS!? A: Fish testes (It could be salmon, cod, anglerfish, squid or pufferfish. This particular picture is cods). Do I even need to explain this? As you already know, yes, obviously it’s just a grasshopper. It’s a grasshopper boiled in sweetened soy sauce. When I was little, I used to think “Ewww, it’s so gross. Why on earth would we eat incects!?”. But when I grew up, as many of us my tastes have changed, and when I tried it I was like “huh? It tastes nice.”. I still think it’s quite gross though. Yes, yes, this is just a bunch of small dried fish as obviously as usual. I don’t know, do we really like to eat creatures as they are? We eat it as a snack or use it as flavor when making soup. So, which one of them would you wanna try? What, all? Wow, you are a brave pioneer. When you come to Japan, just try them with your friends, it must be fun and it’s worth a shot!! !